As the Red Sox were busy beating Atlanta Tuesday night, Cobb Commissioners were unanimously approving to devote $392 million to building a new $622 million stadium for the Braves. Turner Field, the current home of the Braves, opened in 1997. Opponents of the plan were not allowed to speak at the public vote. 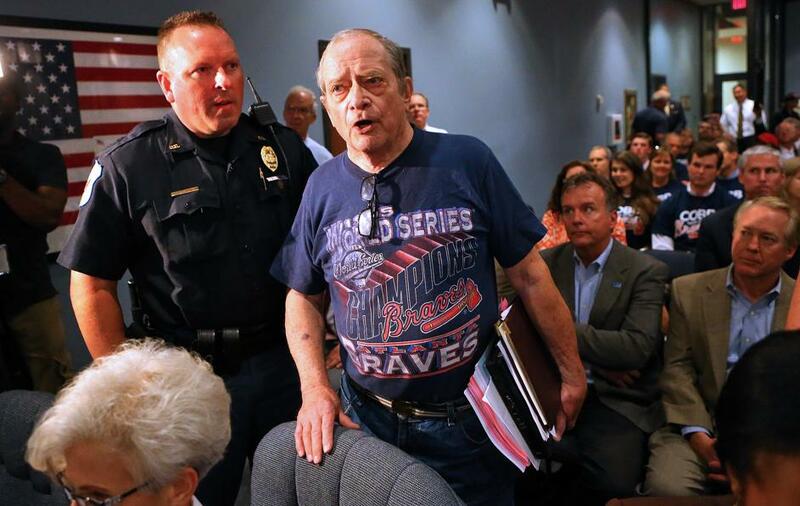 At a packed public meeting, county commissioners approved a series of seven legal agreements with the team, and several community agencies that will be involved in building, operating and paying for a new $622 million ballpark in the Cumberland Mall area. The meeting was over within two hours, and the commissioners approved the deals without questions or debate. Several critics of the deal made their way toward the front of the commission meeting room and asked to be given an opportunity to speak. For a minute, the scene turned tense when they would not relent the floor. They were critical of the process of limiting the floor to a dozen public speakers for such an important vote. The meeting was, of course, dominated by supporters of the stadium plan. They had lined up for the 12 speaking slots by 1:45, more than five hours prior to the 7 p.m. vote. Critics complained that blue-collar workers, who could not leave work in order to dedicate time to the stadium plan, were shut out from the beginning. Rich Pellegrino, a critic of the plan, arrived about an hour before the meeting, but found that he was too late to voice an opinion. The new stadium is scheduled to open in 2017, one year after the Braves’ lease at downtown Turner Field – all of 17 years old – expires. The Braves announced their surprising plans to build a new stadium in Cobb County last November. Atlanta’s attendance averages just over 28,000 this season. “Turner Field is a facility that was built for three weeks of use for the Olympics, but has now served us well for nearly 20 years. The issue isn’t the Turner Field we play in today, but instead whether or not the venue can remain viable for another 20 to 30 years. “Turner Field has served the Braves well since 1997, but it is in need of major infrastructure work, which will cost around $150 million. These upgrades are functional ones, such as replacing worn-out seats or upgrading the stadium’s lighting, and they would do little to significantly enhance the fan experience. If the Braves were to pay for additional projects focused on improving the fan experience, the additional costs could exceed $200 million. *Does not include up to $29 million in additional county debt to pay the first 15 months of interest and up-front borrowing costs. The interest rate at the time of the issuance will determine the exact amount borrowed. The maximum bond issuance could be $397 million. Braves Contribution: $230 million, which can be increased up to $280 million at the team’s discretion. **This is the legal maximum annual debt payment. The exact amount will depend on interest rates at the time of the bond issuance. County officials have estimated the annual payment is unlikely to exceed $24 million.